Sarah Lipstate who is Noveller is one of my favorite guitarists out there. Sorry to have two back to back posts about my favorite guitarists! She is different than Gemma that I brought up yesterday. Noveller is a master of setting up solo ambient loops creating intense soundscapes. Possibly the best in the game. There are plenty of people creating ambient live loops out there. I even dipped my toe into it for a while, but where Noveller takes it to the next level – the intensity. It’s very dramatic. Emotional, sonic.. art. Her career has been really growing and evolving from the point of when I first learned about Noveller. Since those early days, she has opened for St. Vincent and Iggy Pop! I’m sure the exposure has been really great. I had a brief moment to talk to Sarah in person at NAMM this year where she was quite busy with live pedal demos. 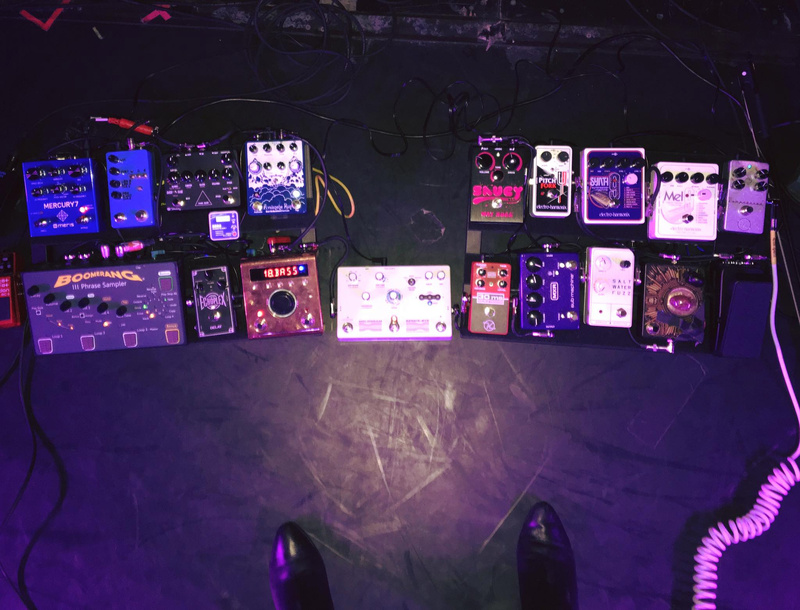 She recently posted this photo of her pedalboard set up on her Facebook page. As always, let me know if you see anything missing or incorrect. Also let me know what you think about this set up by commenting below!